Whoo hoo. 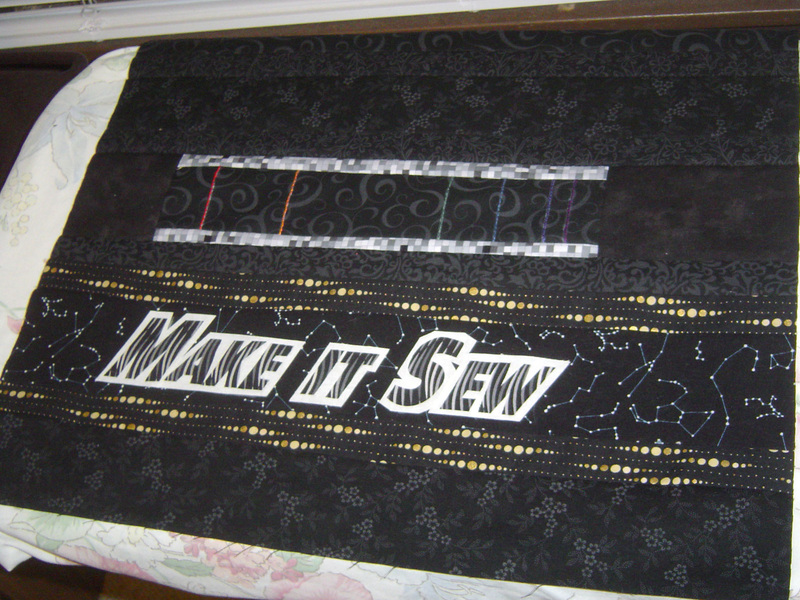 All I needed was one person to agree that the letters on my “make it sew” cover would be hard to see, to convince me that I should go ahead and make the change to my current project. And then I … do-de-do-doo-du … fixed the problem without getting too stressed. As I was considering Jane’s idea of making the white letters bigger and putting them behind, I quick whipped up a photoshop touch up of the design. Placing the larger (paper) letters in back of the smaller letters, I could see I would have problems with the W and E lining up all the way. So I decided to take my backwards printout, make a copy, and draw an eighth of an inch around in block form. Instead of cutting or anything dramatic, I just cut and fused the white right over the letters I made initially. The original letters were already fused down, and they weren’t coming up. I also didn’t consider (too long) remaking the star background piece, considering what I was putting over top was exactly the same size, maybe a little bit larger, even. And then I remade the black letters, it took me some time, but not a TON. And the result is so much nicer. But I swear the comment from Linda proved she was in the room next to me while I was working on this project. She must have been phase shifted, or transported in and out when I was in the other room getting some tea. On a roll now, I was able to sew down the black letters with black thread, sew on the insignia (also black thread), all the time listening to podcasts. 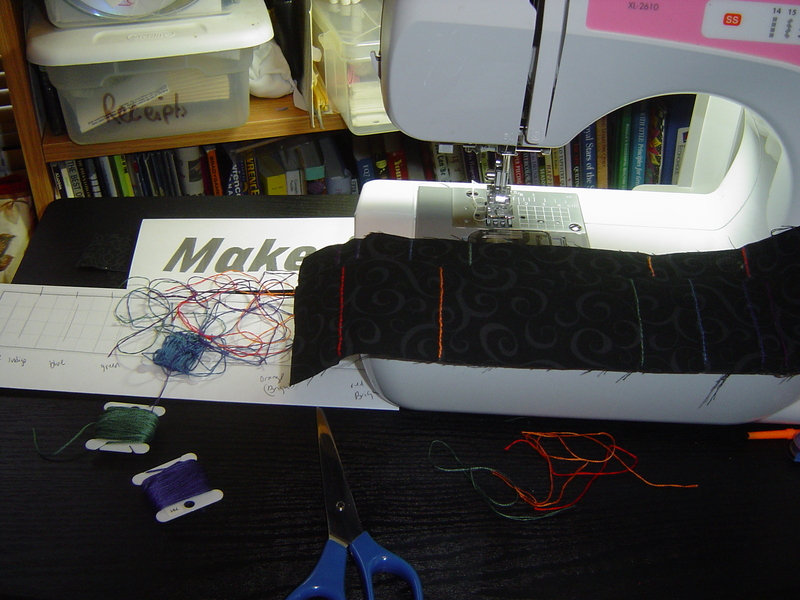 I was a little annoyed with all the starts and stops that go along with sewing down applique with the machine, but it was still incredibly faster than hand applique, my usually preferred method. How could I stop now? 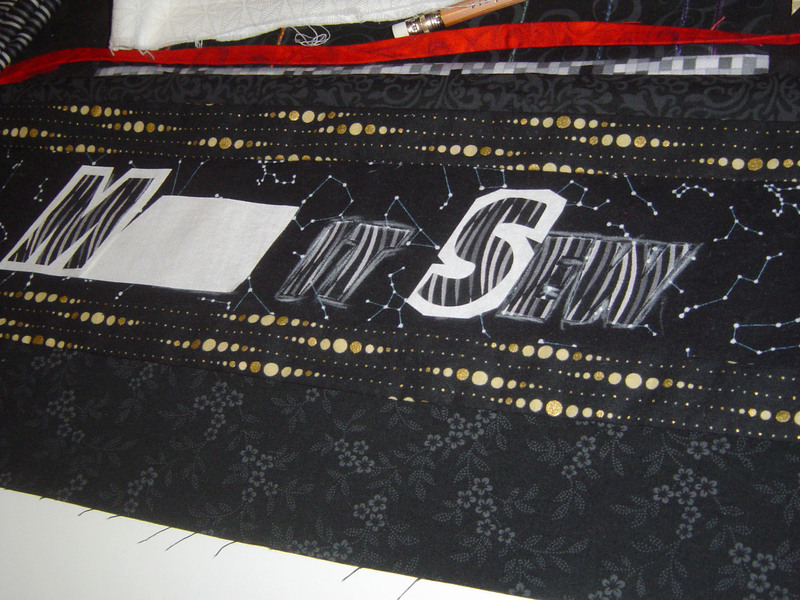 Uninterrupted sewing time, batting, sides already completed, lining fabric easy choice to cut. 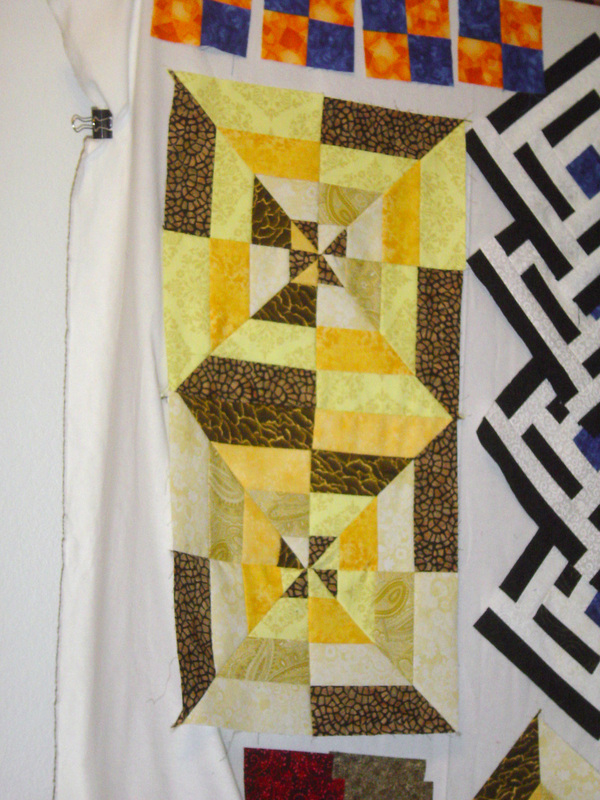 Cut, basted, quilted (straight line) all three sides. Done, done, done. And then I had to see if it would fit right, so i pinned it “how it would look when finished”, not “right sides together to continue on with the project”. You may also be able to see the 5 pins sticking out the back of the top. Theses are where I could feel the hand groove for the machine where I carry it. You draw the opening on the back of some fusible stabilizer. The stabilizer is on the back of a gold fabric that will end up being the trim. Make sure your trim piece has a little bit more fabric on the sides than this pic. You sew around the drawn opening on the outside one eighth to one quarter inch. You (carefully) take your scissors to the slit, cutting apart the fabric and the quilted part, making sure you kinda notch the fabric in the seam allowance. Don’t cut through the sewing line you just made. Start pulling the trim (gold) fabric through the slit you just made. 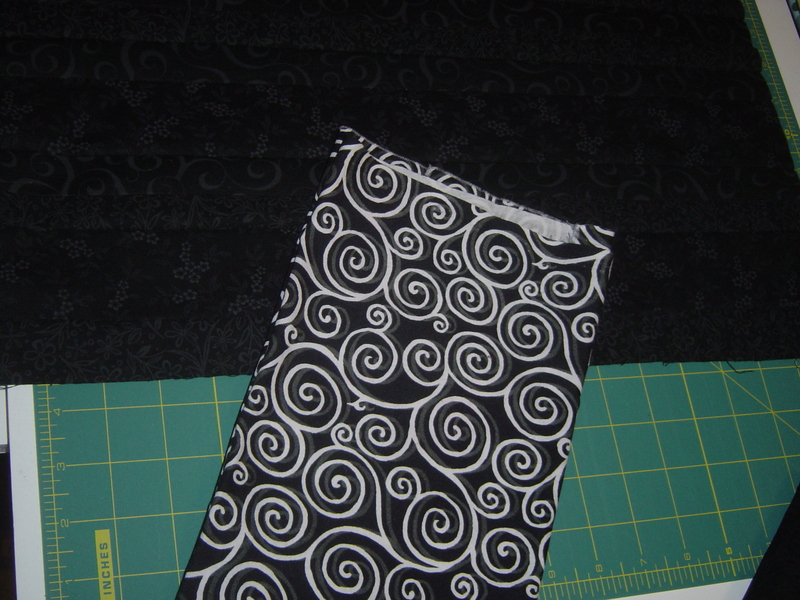 You have to do some creative folding on the corners to have the fabric lay flat. Fold all your trim fabric down into the slit. 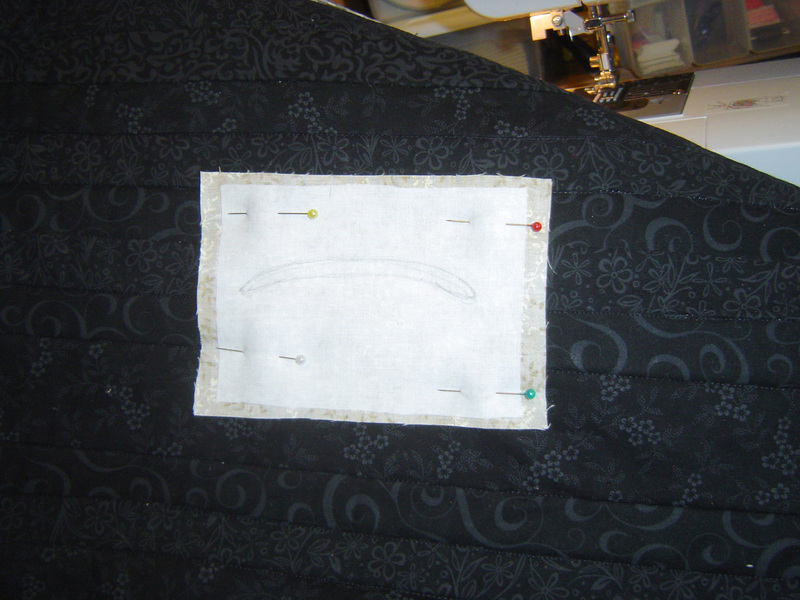 The line you sewed around the edge makes the edge where the trim meets the background. Top stitch just outside of the sewing line, making sure that the fabric on the inside is being caught by the topstitching. Go see Flossie Bottom’s Tutorialwhich makes more sense in pictures. 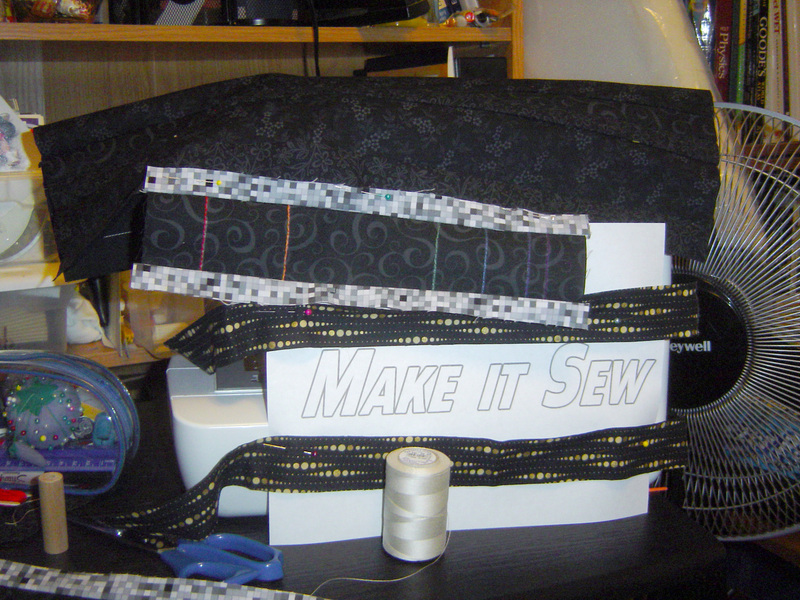 Which looks like this when finished and over the sewing machine. And here’s the front: TADA! Sewing machine cover complete. Can’t wait to blow the minds of all the ladies in the guild. Or whoever gets me to sew next to them. I had the embroidery part done, the insignia cut out, the background done (with all the particular stripes of fabrics fussy cut) and everything that I had to redo today. You can find my other posts on this topic here, here, here, and here. Not much new to report here. Check out yesterday’s post about my Make it Sew project.